Products are usually delivered via UPS ground. Faster delivery can be accommodated at an additional charge. I want you to be completely satisfied with your purchase. If you are not delighted with your Crafted Cases product for any reason, return it within 30 days from ship date for a full refund. Return shipping costs are not included. A returned item must be in new condition with its original packing and accessories intact. A returned item must be received within 30 days of ship date. Crafted Cases will not refund shipping for packages refused by the customer, and these orders are subject to a 20% restocking fee. 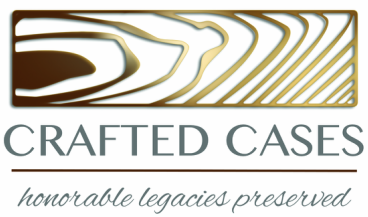 Please note: In general, Crafted Cases will not cover the shipping costs for product returns. If there are special circumstances, then contact me to discuss. If the order you received has notable shortcomings, contact customer service immediately. Please do this within 72 hours of accepting the package from the carrier. Please inspect packages upon arrival. You must report any damage to UPS and Crafted Cases within 3 business days of receiving your order. If you notice any damage to the shipping box at delivery, report it to the UPS driver and then report it to UPS. If you notice any damaged items when unpacking the order, leave the box and its contents as is, save the packaging material and contact UPS to submit a claim. After you contact UPS, contact Crafted Cases so I can resolve the issue in a timely manner. Sometimes shipping and packing errors occur. If you receive an incorrect item, please review your order information to be certain there were no errors in the order process. If you determine you received an item not ordered, contact Customer Service. If you would like to make an exchange or return for store credit, contact Customer Service. Once your return has been received and inspected, a store credit will be issued. At this time, I can ship the requested exchange item, or the store credit can be used to place a new order at your convenience. If you refuse delivery without inspection, miss your delivery appointment(s), or return a non-defective or undamaged product, you will incur original shipping charges along with actual return shipping fees. In the event your returned merchandise was shipped in error, or was damaged or defective, please contact Customer Service to arrange return shipping. Any replacements shipped will be charged as a separate order. Once I receive the returned item, you will be credited or refunded for the returned merchandise. When your returned item is received and processed, you will receive an email from Customer Service letting you know the status of your return and when to expect your return credit. If you have questions or need further assistance with your refund, please contact Customer Service. Please have your return tracking information ready to expedite service. I am committed to processing and shipping your order as quickly as possible. As a result, there is a limited time period after placing your order when I am able to accept a cancellation request. If your order has been shipped, I cannot cancel the order. To cancel an order, please contact me by phone, text, or email. 7.25% Sales Tax is collected on any flag display case ordered in North Carolina. I accept Visa, Mastercard, American Express, Discover, and PayPal. I also accept Government charge cards. Payments will be processed through Authorize.net. Payments are safeguarded with double encryption software. I also have an SSL certificate.